So I have discovered something about myself recently. The older I get, the colder my body temperature is. I don’t know why this is, I mean – I grew up in NY, was born in Illinois, and even lived in Germany for Pete’s sake!!! All places that get Winter like nobody’s business. But after leaving home, living in Florida, and now residing in Virginia Beach – its like my blood has thinned. Don’t get me wrong, I love a little snow. But I need to be bundled up to the brim to be able to enjoy it!! Put me in 50º and I am desperate for my fake Uggs. Its pathetic really – lol. Which is why I am assuming that for this very same reason (the sudden aversion to cold weather), I have been on an absolute faux fur sewing streak the past month. SEW ALL THE THINGS THAT KEEP ME WARM!!! 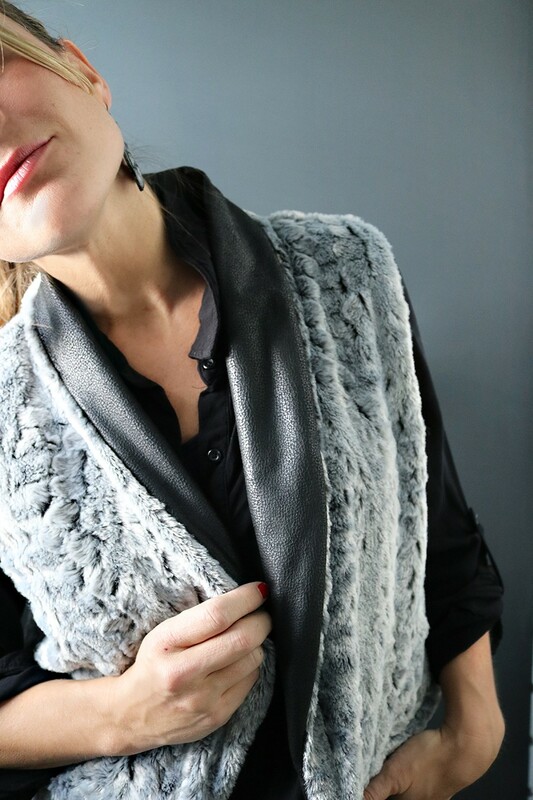 Like a beautiful faux fur shawl collar vest…which is reversible by the way making it even more awesome! 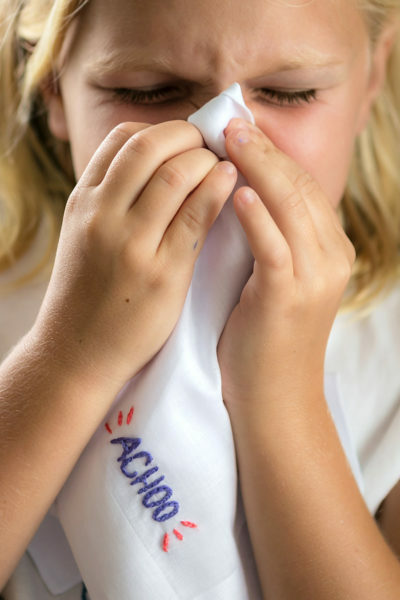 Place your cutting mat on a flat surface, located somewhere near the front door of your home, where it will be easy to pick up and carry outside. After cutting out each pattern piece, carefully pick up each pattern and bring it directly outside to shake it off. Once finished cutting out the pattern pieces, pick up your entire cutting mat and carry it outside to wipe down. Vacuum up the remains, and you should be relatively close to fur free! 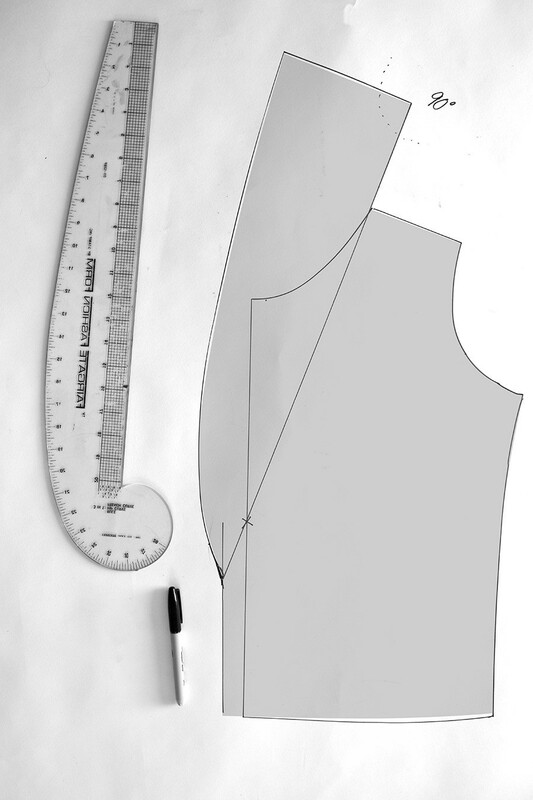 *Please note – if you are using a basic bodice sloper, you will need to add more ease over the body to accommodate a vest fitting over your clothes. A basic jacket pattern front and back pattern pieces will also work for the jacket sloper pattern pieces (THIS Simplicity pattern would work.) Otherwise, you can trace around a jacket or vest you already have to get the main front and back pattern pieces. Measure your back neckline from the shoulder to the middle (usually the fold line). Determine where you want the breakpoint (where the shawl collar turns) of the shawl collar to be along the front pattern piece center. Mark an ‘X’ at this point along the front center. 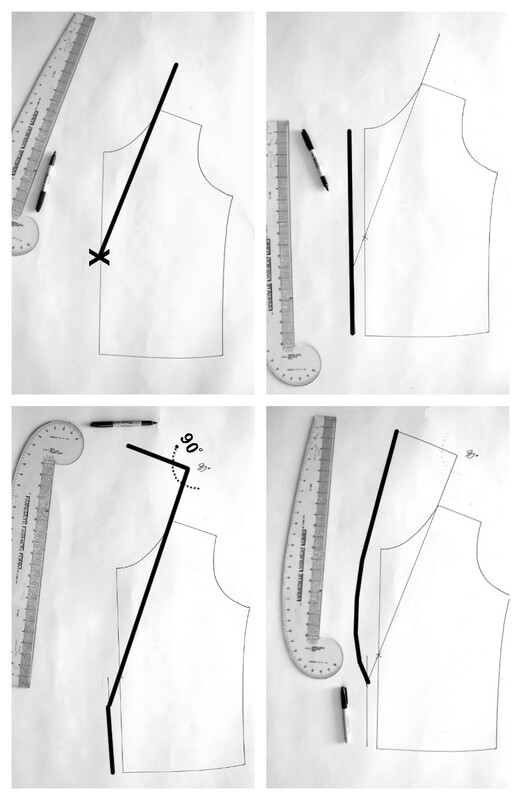 Draw a straight line from your ‘X’, with the line going through your inner shoulder seam, and extends beyond to the measurement you had from Step 1. 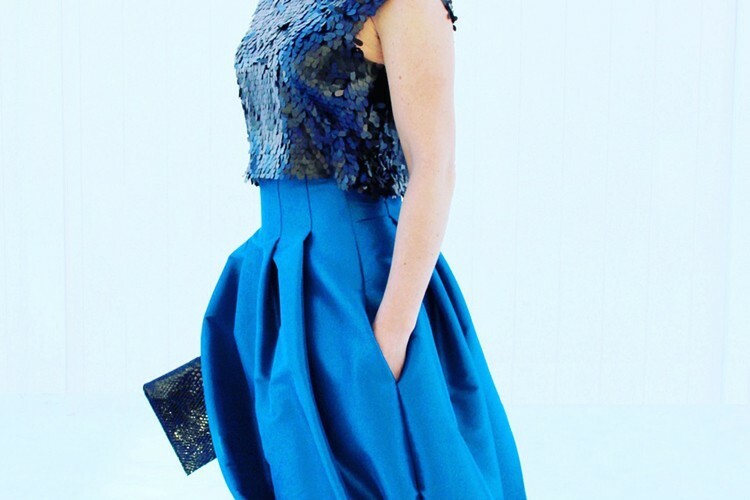 For example, if half of your back neckline was 5”, the line would extend 5” beyond your shoulder seam. If desired, extend the front center 1” beyond the normal front center. This will allow for additional ‘turnage’ of the shawl collar. Determine how large you want your shawl collar to be in width (mine is 6” wide). From the extended line you drew in Step 2, draw a line from the top point, at a 90 degree angle, towards the front center. Draw a curved line from your 90 degree angle line, down to your ‘X’ mark. 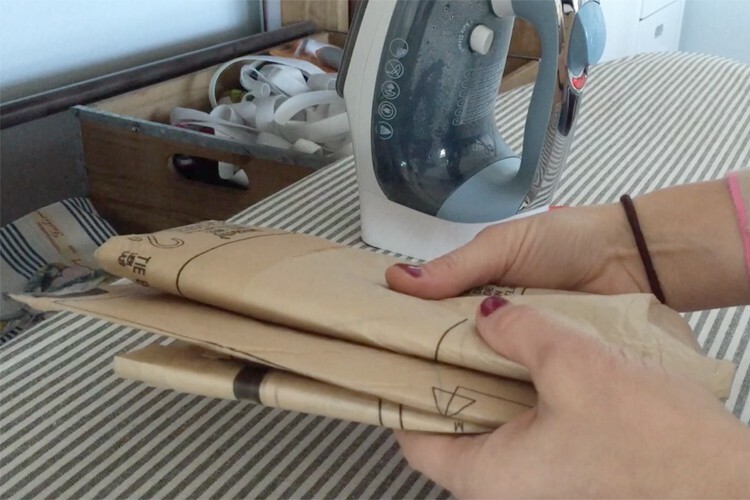 Place your lining front and back right sides together, lining up the side seams. Pin and sew the shoulder seams. Bring the top of the shawl pattern pieces, where the back of the neckline will meet, right sides together. Pin and sew. 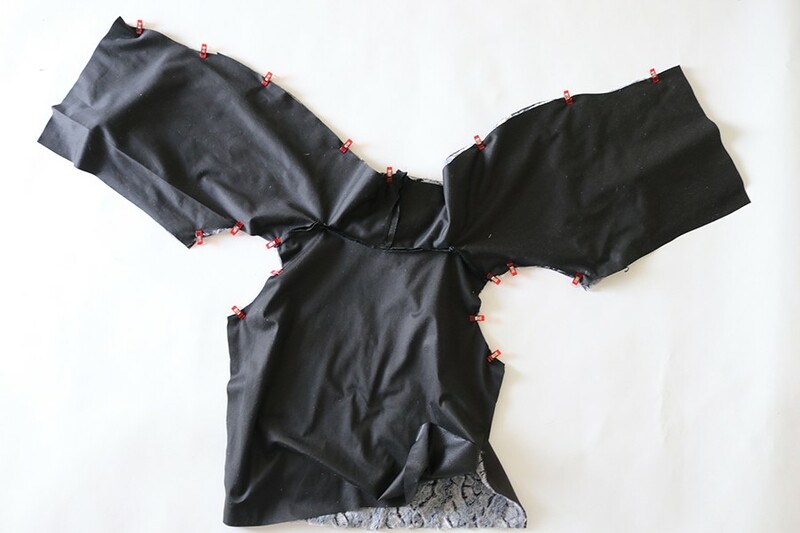 Pin the undercollar of the shawl to the back neckline, right sides together. Sew, and clip all curved seams. Repeat Steps 1 – 3 for lining and exterior. Place lining and exterior right sides together, matching up all seams. Pin along the shawl collar and front center. Sew. Pin along the armsyce and sew. Clip all curved seams and turn right side out. With the exterior right side facing out, line up the front and back vest side seams. Flip the exterior out of the way, and pin the lining of the vest right sides together. When you get to the armsyce seam, bring the exterior front and back of the vest right sides together and continue pinning. Sew and repeat for other side. Hem the jacket as desired. I folded the fur towards the inside 1”, and then again 1” to enclose all raw seams. 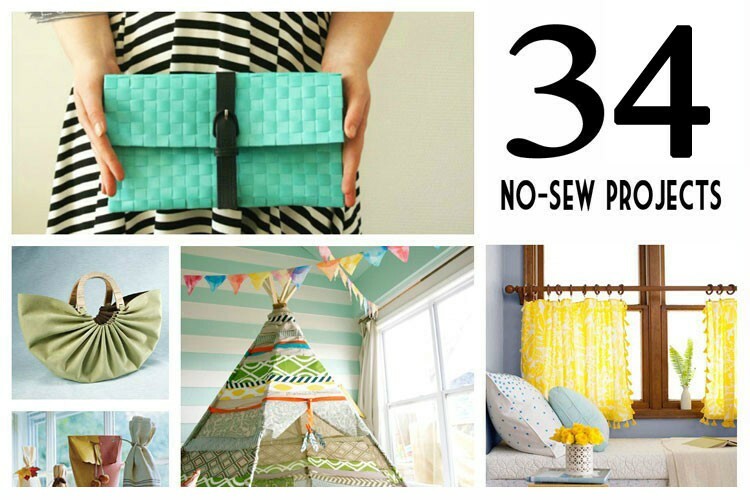 Pin and sew around. 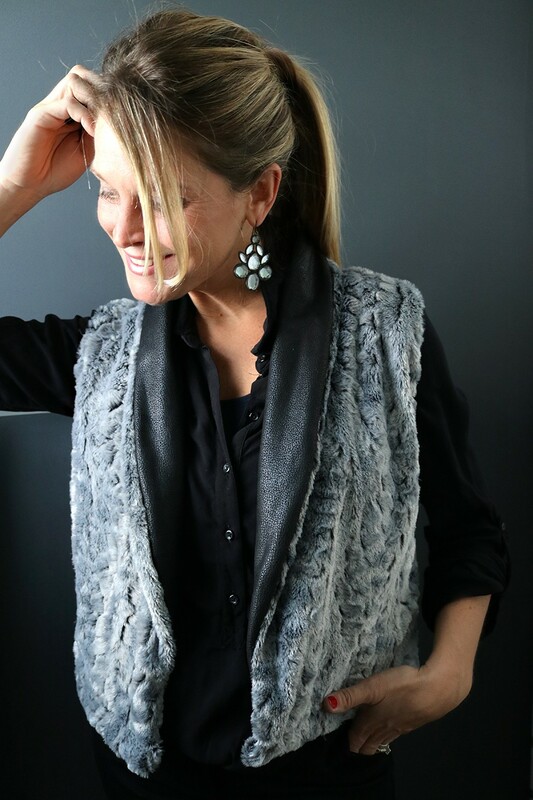 How to add a shawl collar to a regular vest or jacket pattern, and then how to sew a reversible shawl collar vest! To draft the shawl collar, measure your back neckline from the shoulder to the middle (usually the fold line). Determine where you want the breakpoint (where the shawl collar turns) of the shawl collar to be along the front pattern piece center. Mark an ‘X’ at this point along the front center. Draw a straight line from your ‘X’, with the line going through your inner shoulder seam, and extends beyond to the measurement you had from your back neckline. (For example, if half of your back neckline was 5”, the line would extend 5” beyond your shoulder seam.) If desired, extend the front center 1” beyond the normal front center. This will allow for additional ‘turnage’ of the shawl collar. Determine how large you want your shawl collar to be in width (mine is 6” wide). From the extended line you drew beyond the shoulder, draw a line from the top point, at a 90 degree angle, towards the front center. Lastly, Draw a curved line from your 90 degree angle line, down to your ‘X’ mark. 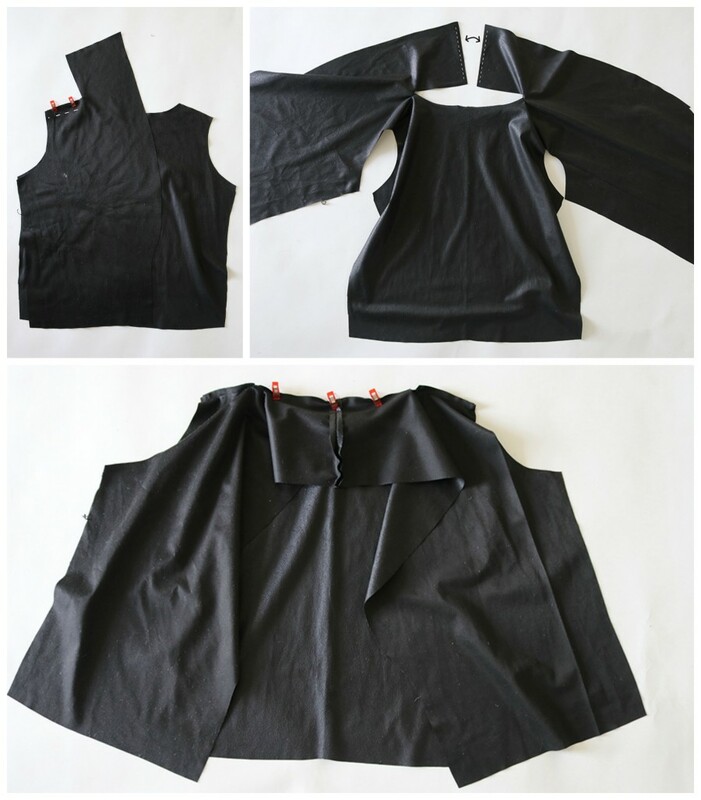 To sew the shawl collar vest, place your lining front and back right sides together, lining up the side seams. Pin and sew the shoulder seams. 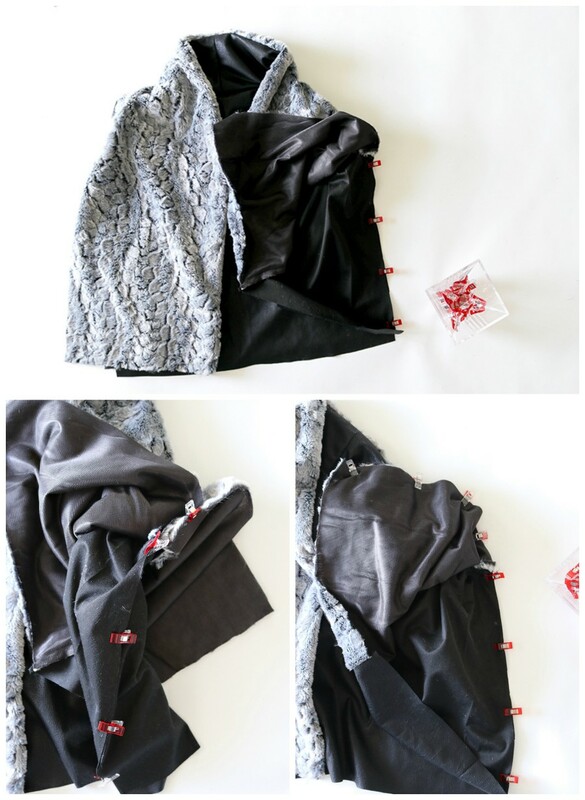 Pin the undercollar of the shawl to the back neckline, right sides together. Sew, and clip all curved seams. Repeat for both lining and exterior. 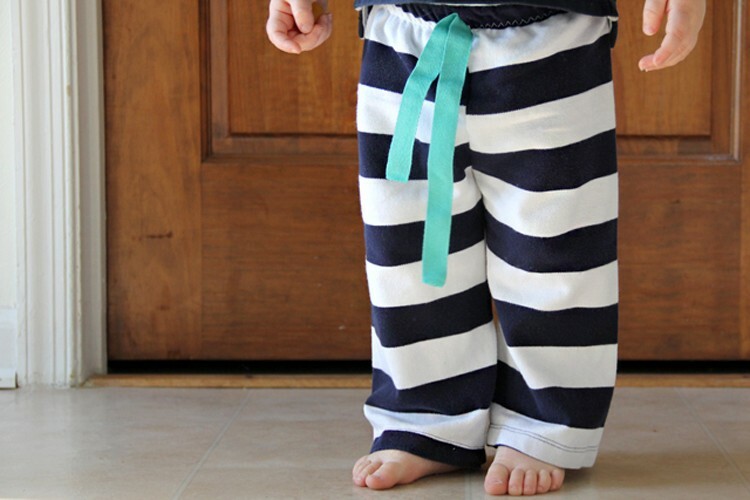 Easiest Baby Pants to Sew, Ever.